Directly below the menu bar you'll find the toolbar. From left to right it has the following buttons. The first three buttons control what happens to selected ships. Select only allows you to select ships. Move also allows you to move ships. Rotate allows you to spin them around their centre point. 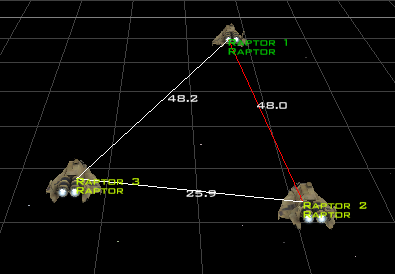 Rotate Locally controls what happens if you rotate several ships at the same time. The picture below demonstrates the difference. 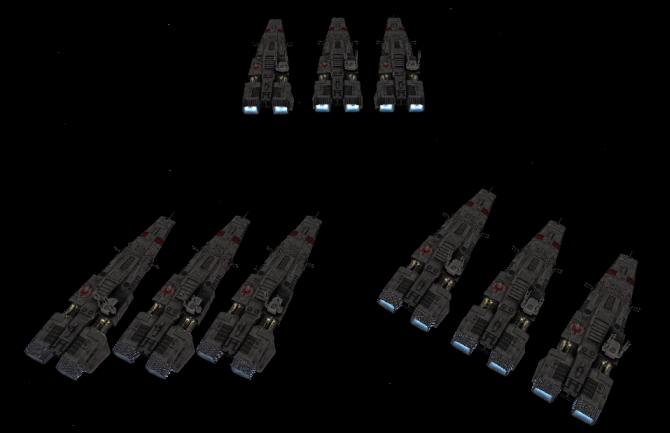 The ships on the left were rotated with the button selected, while the ones on the right had it unselected. Play around with several ships selected and the button pressed and you'll soon understand the difference. The next six buttons are used to choose how a ship will move or rotate when using the mouse. By default a ship can be moved on the XZ plane but you can't move it up or down. If you wish to do that clicking on the Y button will allow movement in that plane but not in any others. Again this is something you can understand much more easily simply by placing a ship and clicking the buttons. The Select List button opens a dialogue allowing you to select ships from a list rather than having to select them manually using the mouse. This is especially useful when one ship is within the radius of another (A viper in a battlestar launch tube is very difficult to select using the mouse for instance. Using the list makes it easy). The top list displays all the objects in the mission. The bottom list only displays wings and waypoint paths (but not the individual waypoints that make it up, those are in the top list). The buttons at the side of the list allows you to change which ships are displayed on the list, making it easier to find the ones you are interested in. 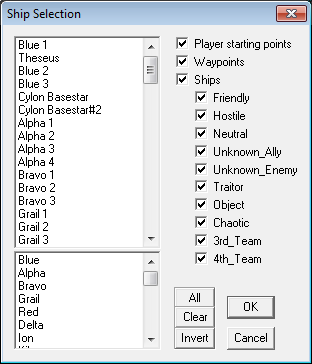 The All, Clear and Invert buttons allow you to select all the ships, none of them and whatever is currently unselected respectively. The last one is useful when you want to do something to every ship except the ones you have selected. Selection Lock allows you to lock the ships to the currently selected ones. If you click on the grid the ships will now be moved there instead of selecting whatever is at that point. The Form Wing button allow you to group the selected ships into a wing. If some of the ships are already in a wing a popup option will give you the option to reform the wing to include ships that aren't included. The Disband Wing button splits an existing wing up into its component ships. The zoom buttons allow you to choose which ships are visible. Zoom Selected will zoom in so that the selected ships fill the entire view. Zoom Extends will zoom out so that all ships are visible. The Show Distances button draws lines between all the selected ships showing how far apart their centre points are. The Rotate Around Object button centres the current object and makes the rotation keys cause all rotation to move around that object rather than rotating the entire scene. Ship Selection Box this box allows you to select which ship you want to place into the mission next. Once you have selected the ship you just have to press the CTRL key and click somewhere to add the ship.